This weekend it was eggs benedict (or a loose variation thereof) again. We didn’t do the Top Chef challenge that we did last weekend, and we didn’t tweet about it to Tom. So, sadly, this week’s eggs benedict did not get a thumbs up from one of the world’s best chefs. It did, however, get a thumbs up from two people you’ve come to know as the 2 frugal foodies. 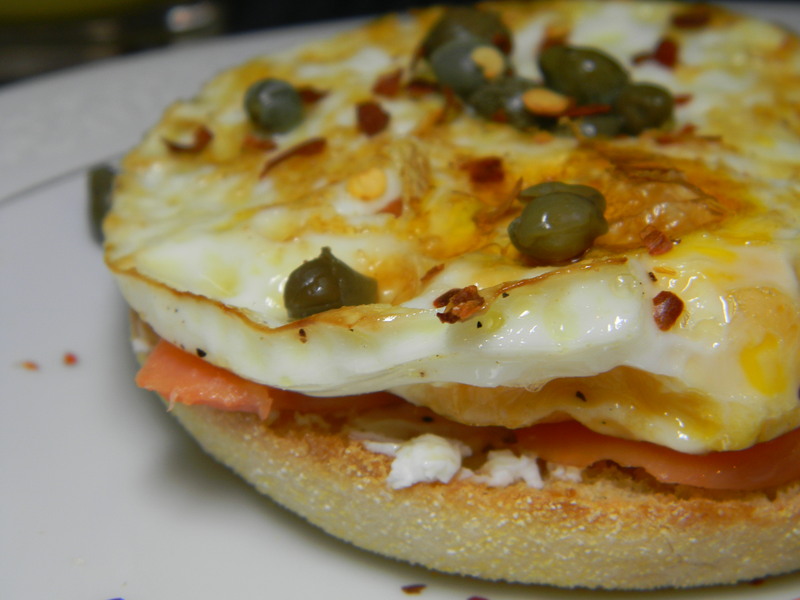 We had a smoked salmon appetizer the night before, had eggs, english muffins, and capers – and thought, why not? As you’ll see from the recipe below, it’s all really simple – just cook the pieces and put it together. We thought it was a great brunch to start a great Saturday. By the way, tomorrow’s Monday. Even though that’s kind of rough to think about, hopefully it will be a good week ahead. Happy last few hours of the weekend!